With Super Bowl Sunday coming up next weekend, its the perfect time to share a fun party appetizer recipe to add to your game day menu! To be honest, I'm not really a football fan, but I do look forward to the Super Bowl every year. It's fun to choose my favourite team (usually based on uniform colours) and to watch the entertainment and big-budget commercials (although sadly we never get to see the best commercials up here in Canada). And of course, I look forward to Super Bowl food! I love sitting around the coffee table in front of the TV eating a meal made up entirely of finger foods, chips and dip. Guacamole is one of the things that has always made an appearance in our family's Super Bowl meal, but this year I wanted to try something a bit different with my guacamole. I had seen these guacamole-stuffed black bean cups on the blog Cake, Batter & Bowl a long time ago but I'd never gotten around to making them, so I decided that now was the perfect opportunity to try them! I've also had plantains on my mind lately, so I knew I wanted to try incorporate them somehow. First, I decided to make some sauteed plantains to top each cup with....and then I thought why not mix them into the guacamole too? I've tried mango guacamole in the past, so I figured another tropical fruit would also taste just as good...and did it ever! I don't like making strong statements like "this was the best guacamole ever", but it turned out even better than I expected! It was so creamy and I loved the way the sweetness of the plantains paired with the lime and avocado - just make sure you get a ripe enough plantain. otherwise it won't mash easily and the flavour won't be as pronounced.. Then the other ingredients like the cilantro, garlic and jalapeno helped to balance out the other flavours and added just a bit of heat to the guacamole. What I loved most about this whole appetizer was that each of the components was so good on its own, but eating them all together made each part taste even better! The black bean cups were the perfect little vessel to hold the guacamole, and this way everyone can just pick up a portable cup instead of the usual chip-and-dip method. The recipe might look a bit long, but each of the components is easy and quick to make. You can even make the black bean cups earlier in the day and then assemble everything right before you want to eat. I think these will definitely earn a permanent spot on my Super Bowl menu from now on! Peel and dice the avocados and place in a bowl. 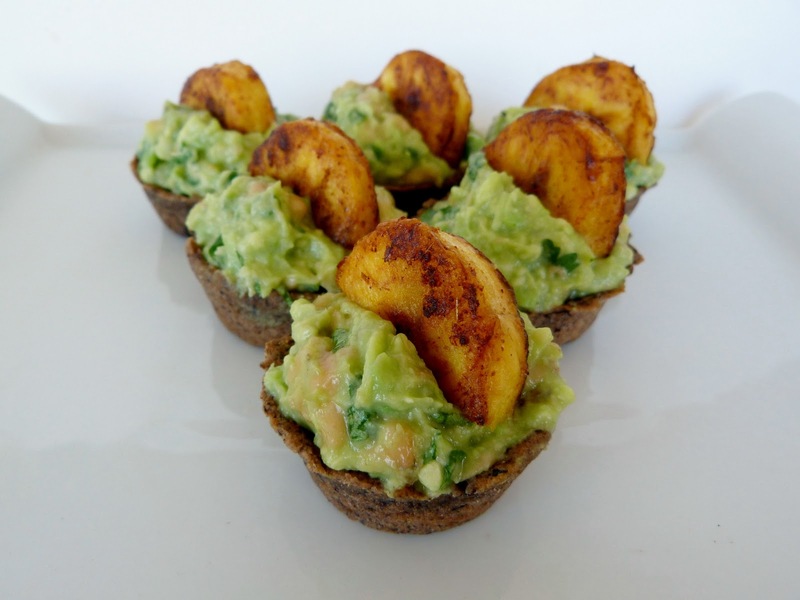 Peel or slice the the skin off the plantain, then cut into small pieces and add to the bowl with the avocados. Mash the avocados and plantain together until creamy (a few chunks are okay). Add the remaining ingredients to the bowl and mix thoroughly. Cover and refrigerate until serving time. Peel the plantain and cut into round slices (you will need at least 12 slices). Place slices in a bowl and sprinkle with chili powder and cumin. Add a couple drops of water to help the spices stick, tossing to coat. Heat olive oil in a skillet over medium heat. Add the plantains and cook for 5-6 minutes, flipping once, until browned. Remove and drain on paper towels. Preheat oven to 350ºF and spray a 24 cup mini-muffin pan (or two 12-cup pans) with cooking spray. Place the black beans, flour, cumin, paprika and salt in a large food processor and pulse a few times to mix. Then keep the processor running while you slowly drizzle in the olive oil. Process until the mixture comes together into a smooth, sticky dough. Divide the dough evenly into the muffin cups and press with your fingers to form cups that spread up the sides of each muffin cup. Bake in the preheated oven for 15-20 minutes, until the cups are set. Remove from oven and cool completely on a wire rack. Fill each black bean cup with a large spoonful of the guacamole. 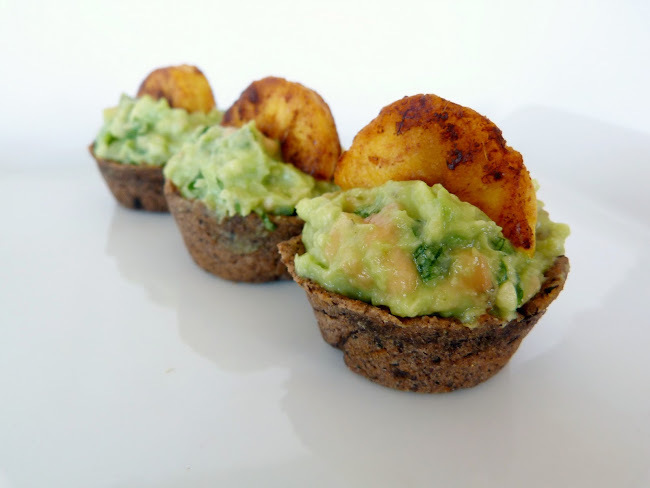 Cut the larger sauteed plantain slices in half and top each guacamole cup with one of the half-slices (you can keep the smaller slices whole). Note: Leftovers won't save very well the next day, but I doubt you'll have any leftovers anyway! If you end up with extra plantains or guacamole after assembling the cups, you can just eat them on their own without the black bean cups. I just tried plantains for the first time last week and they are fun.. I can only imagine what a plantain-spiked guac tastes like.. and those black bean cups are so cute! Thanks for sharing! Thanks! Yeah, I don't eat plantains often but I should - every time I try them I remember how much I like them! these are awesome! what a delicious appetizer/finger food for a party! These were so cute and yummy! I hope you share them with me if you make them again for Super Bowl! Definitely! Although we have to figure out our actual Super Bowl plans first before I start thinking about the food! The muffins sound interesting, can't wait to see them! 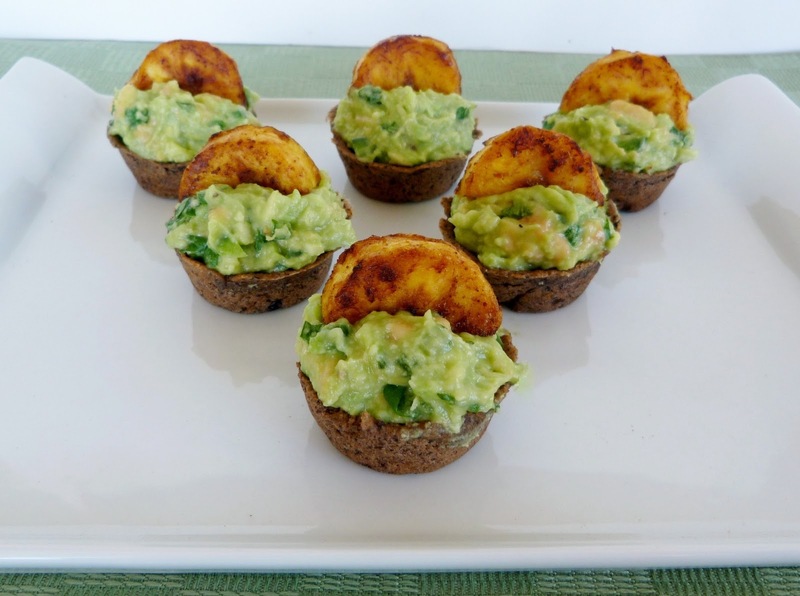 Hope you like the plantain guacamole if you end up making it too! 3. awesome because you are the only other person I know that is not hispanic that cooks their own plantains other than me! Such a good recipe - love it! haha, I love your comments! I think my new criteria for a successful recipe is whether it makes you dance in your chair! I wish plantains were more easily available - I'm lucky I have a latin shop nearby where I can find them! Awesome idea! I will definitely have to try this out! I LOVE this! Not only are they cute, these cups look incredibly delicious and right up my alley! I wonder if I could sub oat flour for the whole wheat to make it gluten free...hmmm I'll have to experiment! Aw thank you! I don't have much experience working with oat flour, but I don't think the type of flour would make much of a difference in the recipe so I don't see why not...if you can make them gluten-free, the recipe would be even better! Thanks Ricki, I'm glad I remembered to link up this week! I'm sure you won't forget its Superbowl time with all the other delicious recipes showing up around the blogosphere this week! Oh my gosh, my husband would love this! Guacamole and plantains are two of his favorite things. I'm not big on guac, but with plantains, I'd definitely give it another try. :) What a great idea! These just look so unique. 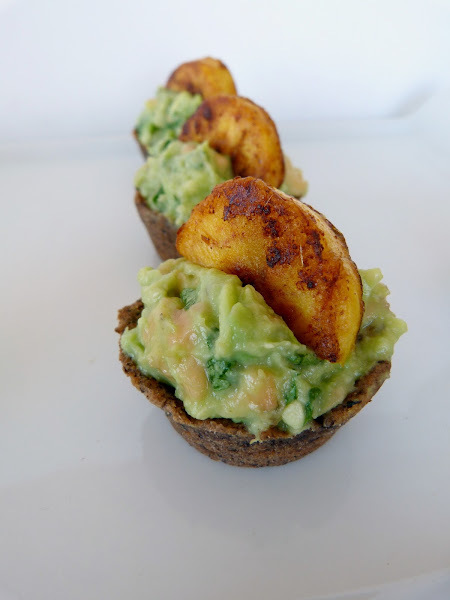 I love little finger foods but never would have thought to put the guacamole and plantains together. Thanks - they actually go really well together, especially with the black beans! Thanks, I'm so glad to hear that! I'll definitely check out your blog too, looks like you have some creative recipes that I would love! I just made these and they were DELICIOUS! My 19-month olds loved them! I only wish I had made more! Awesome, thanks for letting me know! I'm glad you were able to share them with your kids too - I don't have kids of my own, but I imagine its a bonus when you make something that all of you can enjoy!